Dan O'Sullivan Racing :: Is Val A Teetotaller? Because today is the 2nd year in a row that she has won a race at Hanging Rock on New Years Day. So while all the other naughty fillies and mares, colts and geldings are out partying, our girl Val is doing what any good athlete should do pre-race and that is getting a healthy, early night! And an early night it must have been because she won by a whopping 12 lengths! One thing we do know, is her owners are definitely not Teetoallers! And the other ironic thing is her older brother is our old mate Beer Garden!! 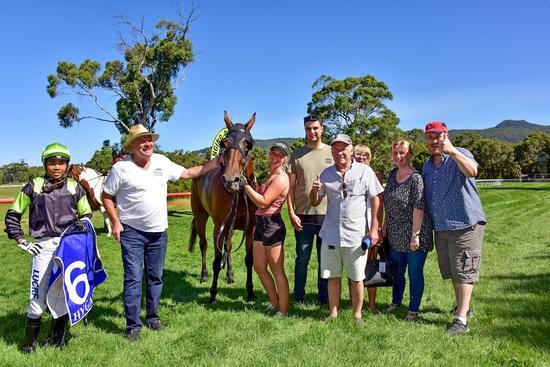 This mare is no star, and she's a little bit quirky, but overall she is an absolute pleasure at the stables and we love nothing better than getting a winner for our fantastic, loyal owners! Today's win makes it number 5 for this girl!